Super quick & easy to make, amazing gingerbread flavor and delish! You know how we love a good bliss bite — our freezer is always stocked with a few of our favorites! These super easy and yummy Gingerbread ones give us that same grab and go healthy snack while feeling incredibly festive! Made with dates, pecans, a little almond butter and lots of yummy gingerbread spices they are packed with nutrients and delicious! 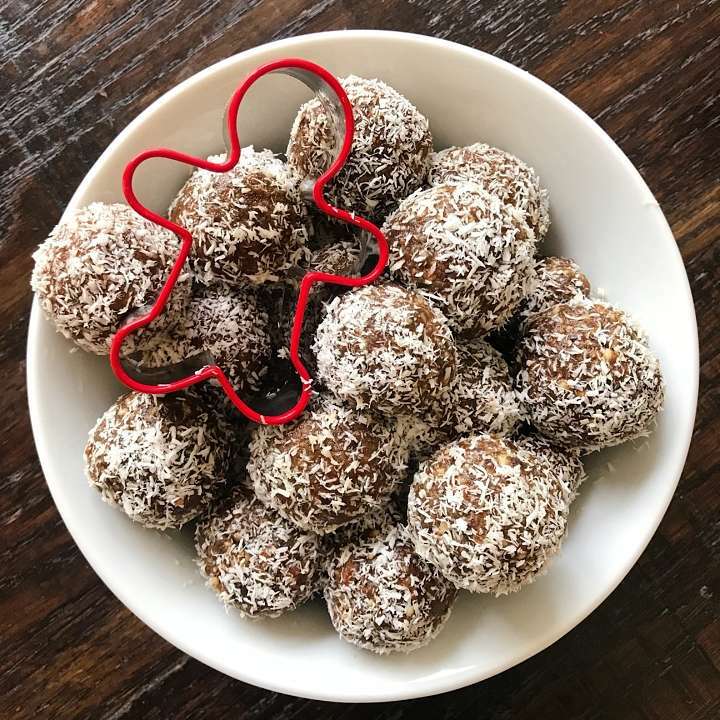 Gluten-free, Vegan, No Bake and packed with nutrients, these gingerbread bliss bites make a perfect grab and go healthy holiday snack! Place dates in a food processor and pulse several times or about 30 seconds until roughly chopped or broken down into small bits. Add molasses, cinnamon, ginger, nutmeg, and cloves and pulse a few times to mix. Add almond butter and pulse several times to combine. Note: when all the ingredients are mixed together, the pecans will still be in small bits, not a paste -- do not over process or oils will start to break down and mixture will become too "wet"
Roll into 1-inch balls and roll in shredded coconut. Keep stored in a sealed container in the refrigerator or freezer.